photo by Steve Hillebrand, courtesy of the U.S. Fish and Wildlife Service. Bald eagles (Haliaeetus leucocephalus) are present year-round throughout most parts of Washington with the highest densities in the Puget Sound region. Individuals occur in the Puget Sound basin as migrants, winter residents and members of the breeding population. They are often associated with shorelines and large, open expanses of water (Stalmaster 1987). Bald eagles are opportunistic foragers that feed most frequently on fish and waterfowl, and as both predators and kleptoparasites, possess a variety of hunting behaviors, consuming live fish and birds as well as scavenging upon dead fish (particularly salmonids), birds and mammals (Watson 2002, Stinson et al. 2007). They are known to hunt in both seabird (Kaiser 1989, Thompson 1989) and great blue heron colonies (Norman et al. 1989). Breeding bald eagles require large trees near open water in locations that experience relatively low levels of human activity. In Washington, surveys by Washington Department of Fish and Wildlife (WDFW) conducted in 2005 showed that nearly all (97 %) of surveyed bald eagle nests were within 3,000 feet of shoreline (Stinson et al. 2007). While nests are most numerous near marine shorelines, many are also found on shores of lakes, reservoirs, and rivers of Washington. In a more detailed study of 53 breeding pairs throughout western Washington from 1986 - 1997, Watson et al. (2002) found that the mean home range size of 53 bald eagle pairs distributed across lakes, marine shorelines, rivers and bays was 4.9 km2, and ranged from approximately 2 to 7 km2. The density of nesting eagles depends on many factors that affect habitat quality including prey populations, degree of human disturbance, and the availability of nest and perch trees. Breeding pairs initiate nesting activities in January or February and disperse by late summer when many migrate north to coastal British Columbia and southeast Alaska for several weeks to take advantage of food supplies associated with late summer and early fall salmon runs (Watson 1998). The timing of breeding activities in Washington has been summarized by Watson (2006). Fledglings also disperse northward, but they may remain there for several months before returning to Washington. Washington’s wintering eagles begin to arrive in October from northern breeding territories in Alaska and Canada. Most adults arrive in November and December and many juveniles arrive in January (Buehler 2000, Watson 2001). The winter distribution of bald eagles in Washington is similar to the breeding distribution, but more concentrated at salmon spawning streams and waterfowl wintering areas. Winter ranges are considerably larger and more variable than breeding ranges. Threats to bald eagles include habitat degradation and reductions in prey such as salmonids in Puget Sound and its surrounding watershed. Alteration of upland nesting habitat from natural events (e.g., windstorms) or human-related factors (e.g., timber harvest, development) that results in either mortality or reduced availability of nest trees or suitable territories, can reduce the number of occupied nesting territories. Because average life expectancy of nests can be shorter than that of breeding birds (Stalmaster 1987), bald eagles often need trees of similar stature located nearby to serve as replacement nest trees if a nesting territory is to persist at the site. Bald eagles in Washington were listed as Threatened under the federal Endangered Species Act (ESA) in 1978. The widespread use of DDT between the 1940s and 1970s is widely viewed as the main cause of the decline of bald eagles in Washington and the other 48 states, though direct extirpation and habitat alteration are also known causes (Stalmaster 1987). In response to rebounding populations, the bald eagle was removed from protection under the ESA in 2007 (USFWS 2007a). The bald eagle is still protected by the Bald and Golden Eagle Protection Act and the Migratory Bird Treaty Act (USFWS 2007b). At the state level, bald eagles were down-listed to Sensitive status by the Washington Fish and Wildlife Commission. Habitat protection is still authorized in Washington by the Bald Eagle Protection Law of 1984 (RCW 77.12.655), which requires the establishment and enforcement of rules for buffer zones around bald eagle nest and roost sites. Habitat is protected through bald eagle management plans approved by WDFW. Between1986 and 2005, over 2,900 bald eagle plans were developed between WDFW and various landowner entities for activities on private, state, and municipal lands in Washington (Stinson et al. 2007). The most recent statewide breeding season census conducted by WDFW, in 2005, found 840 occupied nests in 1,125 territories searched (Stinson et al. 2007). Breeding activity was confirmed by the presence of eggs or shells in or around the nest or observations of adults incubating eggs or brooding chicks. 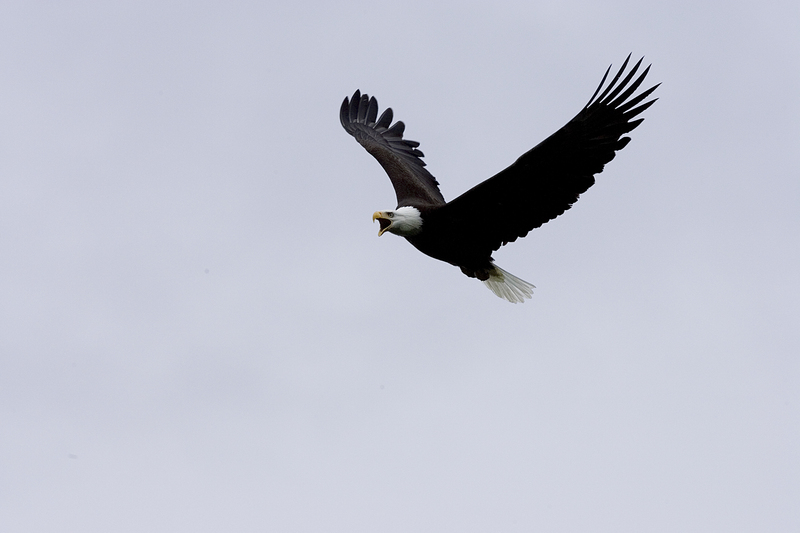 WDFW began localized monitoring of bald eagle nests in the San Juan Islands in the early 1960s. The first extensive survey that covered Washington’s entire marine shoreline was conducted in 1975 and statewide comprehensive activity and productivity surveys were conducted annually from 1980-1992. Nest activity surveys were continued through 1998, and conducted again in 2001 and 2005. From 1981 to 2005 the nesting population in Washington had increased seven fold (Figure 1)(Stinson et al. 2007). The number of bald eagle territories in Puget Sound also increased substantially (Figure 2)(Stinson et al. 2007). As of 2010, there were 751 known territories in the Puget Sound Basin, with most sites occurring in San Juan, Clallam, Island and Skagit counties (Table 1). Although historical estimates of the bald eagle population are not available, Stinson et al. (2007) estimated 1,328 serviceable breeding locations (SBL; analogous to a territory) existed in Washington prior to European settlement. We note, however, that the estimate of SBLs included various assumptions that cannot be evaluated relative to conditions of the 19th century. The number of known territories in 2010 was 1,403 (WDFW database), which suggests the population may be at or near carrying capacity. While the carrying capacity of bald eagles in Washington is not known, a recent decline in nest occupancy rate suggests that nesting habitat in parts of western Washington may be approaching saturation (Stinson et al. 2007). The number of resident breeders, and trends in localized winter counts suggest that Washington state hosts approximately 4,000 resident and migratory bald eagles each winter (Stinson et al. 2007). Table 1. Number of bald eagle territories in those portions of Washington counties that are included in the Puget Sound basin. Data from WDFW database, methods according to Stinson et al.2007. 1. The carrying capacity of bald eagles is unknown and likely varies from one ecosystem type or condition to another. Future monitoring will be necessary to identify carrying capacity. 2. Because bald eagles are closely associated with the marine environment, they are potentially vulnerable to contaminants in the marine food chain. The extent to which they may be vulnerable and the specific contaminant groups that might influence their physical or behavioral health are unknown. 3. The human population is expected to increase substantially in the next three decades. Much of the increase in Washington's population will likely occur in the Puget Basin. Potential responses to increased human pressures on habitats associated with nest territories, and the ability of existing rules to protect those habitats given increasing human pressures, are unknown. Bald eagle abundance in Washington has increased in the past three decades, likely in response to federal and state management efforts. The number of nesting pairs in Washington is approximately eight times the number present when the use of DDT was restricted in 1972 (Stinson et al. 2007). In Puget Sound, the predicted rise in human population will continue to increase pressure on nesting and roosting habitats. State bald eagle protection rules (WAC 232-12-292), along with other forest clearing regulations, may allow the population to persist at or near its current level. Buehler, D. A. 2000. Bald eagle (Haliaeetus leucocephalus) Birds of North America No. 506. 40 pp. Birds of North America, Philadelphia, PA.
Kaiser, G. W. 1989. Nightly concentration of bald eagles at an auklet colony. Northwestern Naturalist 70:12-13. Norman, D. M., A. M. Breault, and I. E. Moul. 1989. Bald Eagle incursions and predation at great blue heron colonies. Colonial Waterbirds 12:215-217. Stalmaster, M. V. 1987. The bald eagle. Universe Books, New York. Stinson, D. W., J. W. Watson, and K. R. McAllister. 2007. Washington State status report for the bald eagle. Washington Dept. of Fish and Wildlife, Wildlife Program, Olympia, WA. Thompson, S. P. 1989. Observations of bald eagles eating glaucous-winged gull eggs in western Washington. Northwestern Naturalist 70:13-14. USFWS. 2007a. Removing the bald eagle in the Lower 48 states from the list of Endangered and Threatened wildlife: Final Rule. Federal Register 72: 37346-37372. USFWS. 2007b. Authorization under the Bald and Golden Eagle Protection Act for take of eagles. Federal Register 72:31141-31155. Watson, J. W. 2002. Comparative home ranges and food habits of bald eagles nesting in four aquatic habitats in western Washington. Northwestern Naturalist 83:101-108. Watson, J.W. 2006. Bald eagle nesting chronology in western Washington. Washington Birds 9:8-11. Watson, J. W., and D. J. Pierce. 1998. Ecology of bald eagles in western Washington with an emphasis on the effects of human activity. Washington Department of Fish and Wildlife, Olympia. Watson, J. W., and D. J. Pierce. 2001. Skagit River bald eagles: movements, origins, and breeding population status. Washington Department of Fish and Wildlife, Olympia.